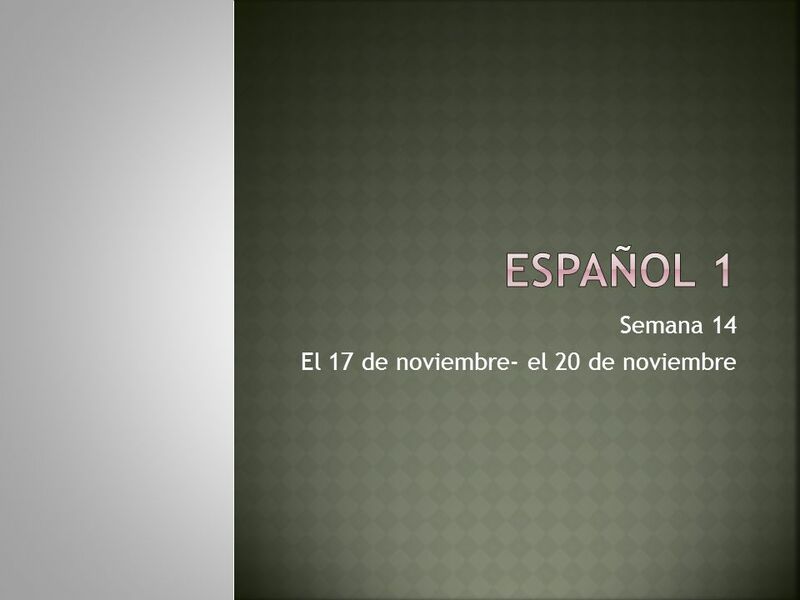 Semana 14 El 17 de noviembre- el 20 de noviembre. 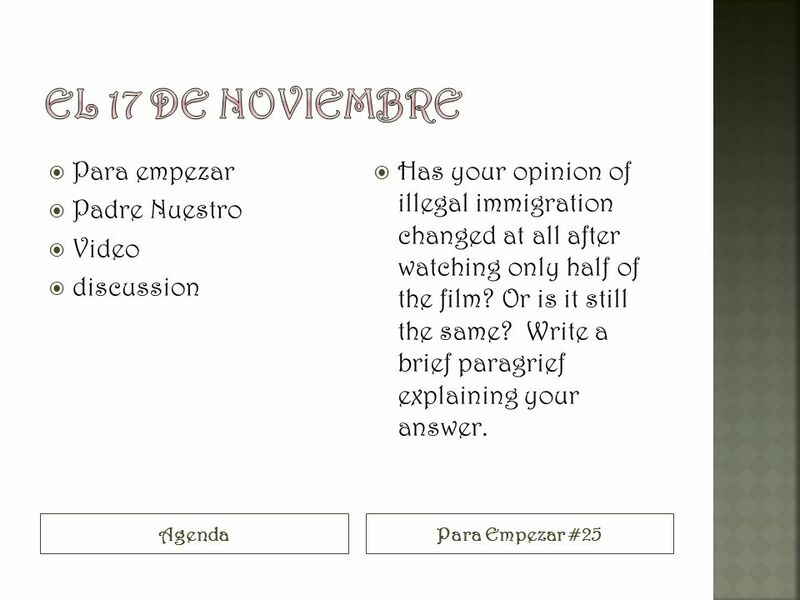 2 AgendaPara Empezar #25 Para empezar Padre Nuestro Video discussion Has your opinion of illegal immigration changed at all after watching only half of the film? Or is it still the same? Write a brief paragrief explaining your answer. 3 AgendaDiario Padre nuestro Abecedario Película No van a tener diario hoy. 4 AgendaPara empezar #26 Padre Nuestro Abecedario Finish movie Para Empezar Project #2 Begin chapter 3 After movie: After having watched a movie from the perspective of illegal immigrants, what are your views? If your views changed, why did they? If they didnt, what did you think about the movie in general? Did you enjoy it? 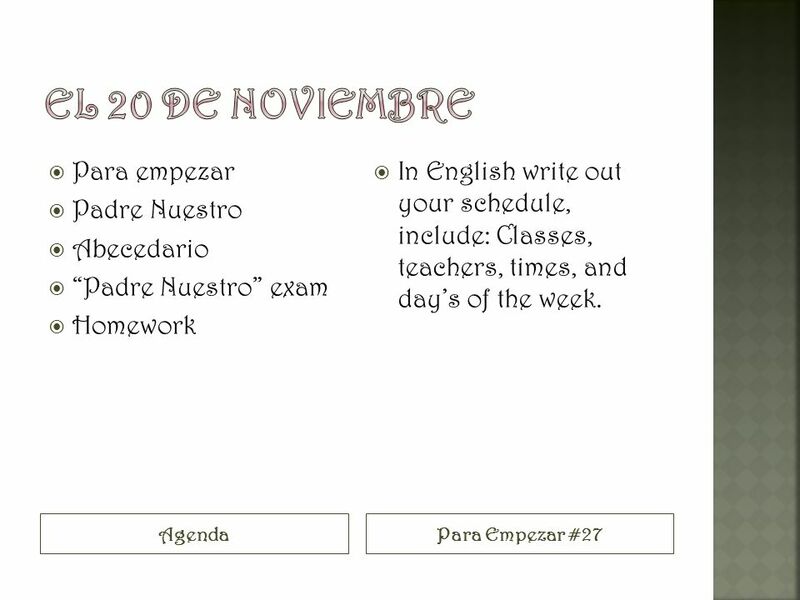 5 AgendaPara Empezar #27 Para empezar Padre Nuestro Abecedario Padre Nuestro exam Homework In English write out your schedule, include: Classes, teachers, times, and days of the week. 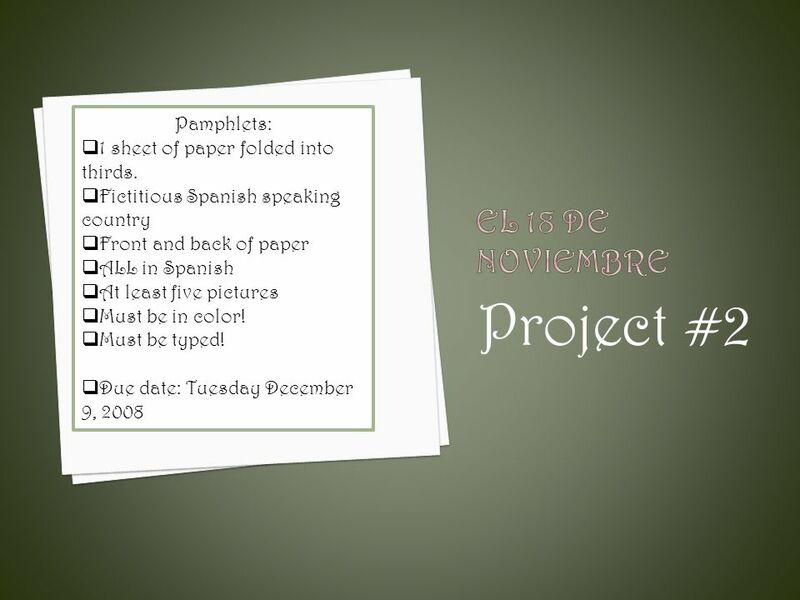 6 AgendaDiario Padre Nuestro Abecedario Terminar película Gramática Actividad Handouts Tarea ¿ Usted sabe alguien qué cruzó la frontera ilegalmente? ¿Cómo lo hicieron? 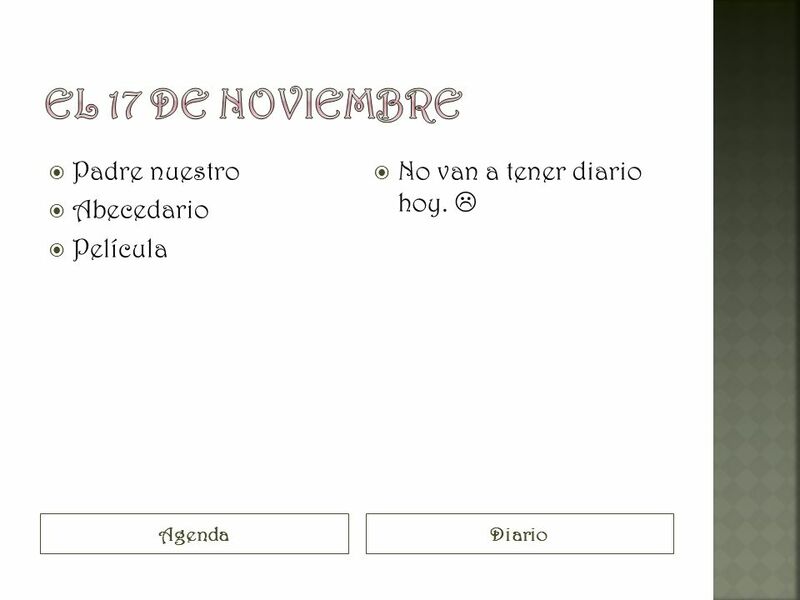 Descargar ppt "Semana 14 El 17 de noviembre- el 20 de noviembre." El Enfoque: jueves, el 25 de febrero Take out storyboard ¿Cómo se llama el hamster? –Vota para tu nombre favorito –Escribe el nombre en una hoja de papel. ¡Cinco Minutos! Turn in your signed parent letter into the drop off folder Take out a sheet of loose leaf paper Write down your name, date and period at. 1. EDUARDO QUIERE COMER EL PESCADO. 2. ASÍ QUE, MARTA QUIERE IR A LA CASA POR (FOR) EL PESCADO. 3. MARTA QUIERE QUE EDUARDO COME EL PESCADO PORQUE ELLA.